Okra lovers, unite! My Mama’s Bhindi Okra will soon become a new favorite in your weekly menu rotation. Even if you’re a non-okra lover, give this easy recipe a try. 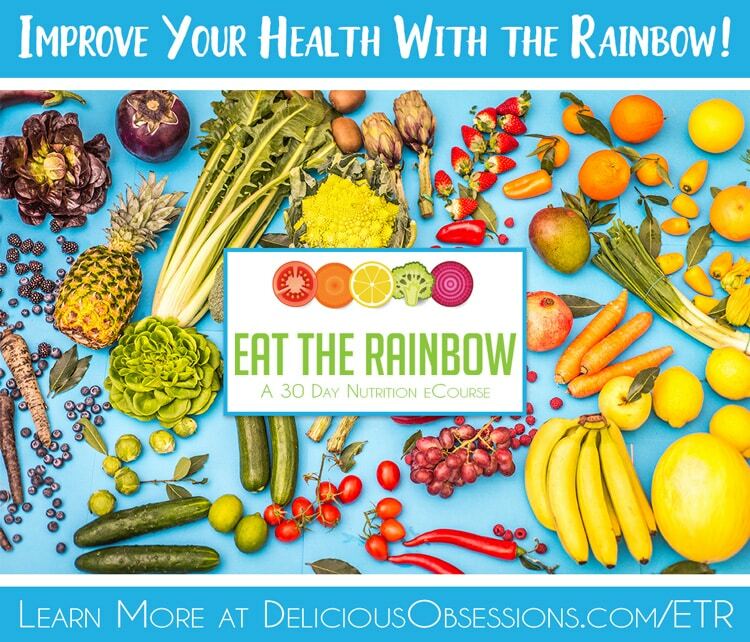 The rich Indian spices and coconut oil create a flavorful dish that even the pickiest of eaters might enjoy. I have a confession. I pretty much HATE okra. I think it’s gross. Slimy. Icky. I’ve always hated it, even since I was a little kid. I remember my mom occasionally cooking okra when I was a child and it was SO GROSS! Except when it comes to my Mama’s Bhindi Okra recipe. Something about this recipe has turned me into an occasional okra lover (I’m not full time in the okra love department yet). And I have my mom to thank for that. 🙂 Hence the reason this recipe is named Mama’s Bhindi Okra. A year or so ago, I went to my folk’s house for weekend lunch and my mom (who is a fantastic cook) had made a pan of this Bhindi Okra. I initially planned on skipping this dish, but as she made it and the fragrant spices filled the house, I thought I might be brave and give it a try. I was fully prepared not to like it. But you know what? It wasn’t bad. So I ate a little more. And then I realized it was actually pretty good! I am a huge fan of curries and Indian flavors in general so it really isn’t surprising that I liked this Bhindi Okra dish too. It just took me getting past my childhood memories of “ick!” to give it another go as an adult. Y’all know how I enjoy me some food history. Well, I actually learned some really interesting things when I was researching the origins of this weird plant. Okra is big in the South and my family is all Southern. But, it’s also used regularly in cuisines around the world. 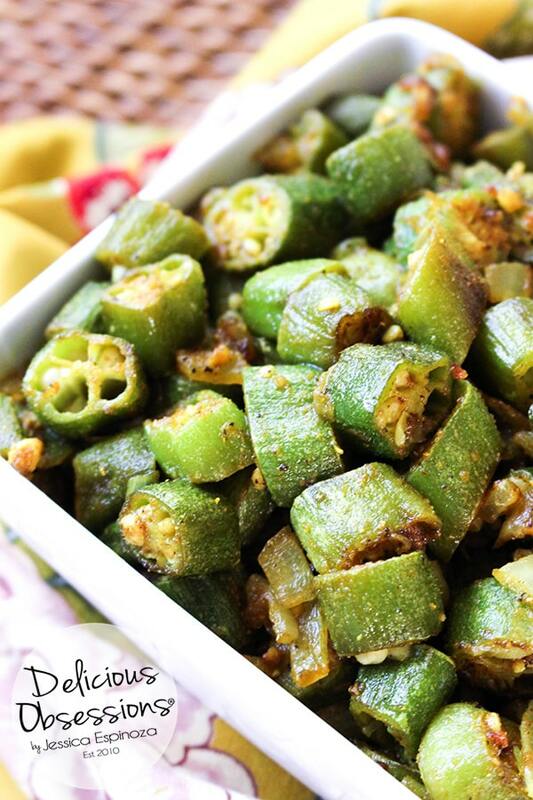 For this Bhindi Okra recipe, you can use fresh or frozen okra. Either one will work. I always use frozen since it’s rare that I see fresh okra around here. And it’s easy to keep a couple of bags of frozen okra in the freezer for those nights when I need a super fast side dish. If you use frozen okra, make sure you saute the okra first and get it browned before adding the onion and spices. Cooking the frozen okra first helps it not turn as slimy because you cook off a lot of the water that has built up in the freezer. 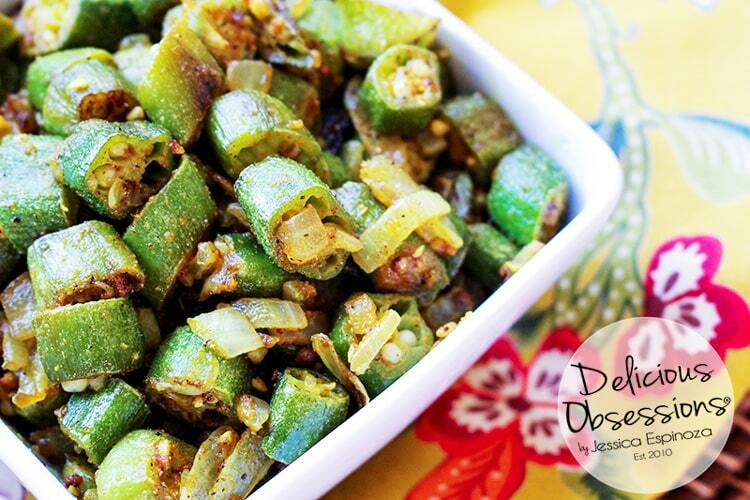 Speaking of sauteing, make sure you use plenty of coconut oil (or oil of your choice) in this Bhindi Okra recipe. Don’t be afraid to use LOTS of oil. You’ll be surprised how quickly the oil gets soaked into this recipe. I always use more than I think I’ll need, only to need to add a bit more to the pan later on. The oil also helps the okra get a little crispy instead of mushy. My recommendation is to use coconut oil. The flavor pairs perfectly with the spices in this dish. IMPORTANT NOTE: If you are using frozen okra, you will cook that FIRST to get it to brown a bit before adding the onion and garlic. If you are using fresh okra, you will saute the onion and garlic first and then add the okra after those are browned. Slice your okra and set aside. Dice your onion and garlic. Melt oil in a large skillet over medium heat. Add garlic and cook until fragrant (1-2 minutes). Stir in the sliced okra. Add the spices and salt and stir well to combine. Cook uncovered for a few minutes and then reduce the heat to medium-low. Cover the pan. Cook for 15-20 minutes, stirring occasionally until okra is fork tender. Add the frozen okra to the pan. Be careful not to splatter yourself with hot oil! Let that cook for 8-10 minutes, stirring occasionally. While that's cooking, dice your onion and garlic. Once the okra has started to brown, add your onion and garlic and stir to combine. Sprinkle the spices and salt and stir to combine. Cook uncovered for a few minutes and then cover, reduce heat to medium-low and cook for another 8-10 minutes or until tender.